BEIJING, March 8 (Xinhua) -- Chinese President Xi Jinping on Friday called for more efforts to implement the rural revitalization strategy with the chief goal to modernize agriculture and rural areas. "The top task for implementing the rural revitalization strategy is to ensure supply of important farm produce, grain in particular," said Xi, also general secretary of the Communist Party of China Central Committee and chairman of the Central Military Commission. 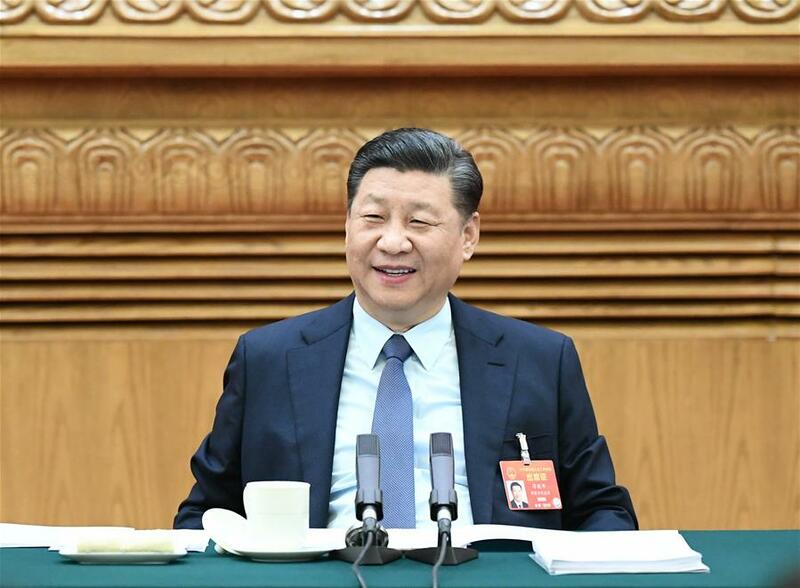 He made the remarks when joining deliberation with deputies from Henan Province at the second session of the 13th National People's Congress, China's national legislature. Efforts should be made to promote the supply-side structural reform in the agricultural sector to achieve food security while building a modern and efficient agriculture, Xi added. Xi also called for enhanced protection of agriculture ecological environment and prevention and treatment of pollution in rural areas. Xi stressed strict penalties on crimes involving food safety so as to ensure safe farm produce for the public. Efforts should be made to strengthen the leadership of grassroots Party units in the rural areas, Xi said, noting that the practices of rural residents' self-governance should be further explored. Xi also called for measures to promote two-way flow and equal exchange of factors, including human resources, lands and capital, between urban and rural areas. "The task to eradicate extreme poverty must be fulfilled by 2020," Xi stressed. Implementation of the rural revitalization strategy and seeking progress in work related with agriculture, rural areas and farmers should be taken into consideration and promoted in the overall economic and social development, Xi said. Li Keqiang, Wang Huning and Han Zheng -- members of the Standing Committee of the Political Bureau of the CPC Central Committee -- on Friday also separately joined deliberation with NPC deputies. Premier Li Keqiang stressed building a business environment that is fair and convenient for enterprises under all forms of ownership, when joining a deliberation with deputies from Hubei Province. He called for efforts to fully carry out the reforms of tax and fee cuts and further stimulate the market vitality. Wang Huning, a member of the Secretariat of the CPC Central Committee, asked deputies from central China's Hunan Province to take bigger steps in pushing forward high-quality development. He also called for taking a people-centered approach to further live up to people's new expectations for their cultural lives. Joining the deliberation of the Beijing delegation, Vice Premier Han Zheng underlined deepening the coordinated development of the Beijing-Tianjin-Hebei region to further relieve Beijing of functions nonessential to its role as the capital.